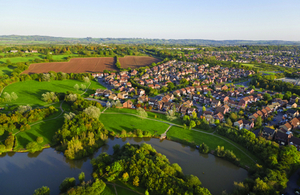 Five brand new garden towns have been unveiled unlocking up to 64,000 much-needed homes across England, the Minister of State for Housing has announced today (25 March 2019). The locally-led new communities, from Hertfordshire to Gloucestershire, will receive a share of £3.7 million of funding to fast-track specialist survey work and planning works necessary for each new town’s development. Councils and groups from around the country submitted more than 100 ambitious proposals with the 5 taken forward receiving an initial £750,000 to help develop plans for vibrant, thriving settlements where people can live, work and raise families. Today’s announcement is the next step in the government’s drive to build the homes this country needs, and follows the news last month of a £9 million investment to speed up the building of existing garden towns and villages. Minister of State for Housing Kit Malthouse MP said: ‘These new towns will not only provide homes for families, but will be vibrant communities where everyone, including neighbouring communities can benefit from new infrastructure – leaving a legacy for future generations to be proud of. I congratulate these councils who have put forward ambitious proposals, which will build many thousands of high-quality homes, and am pleased to support them as they work to make these plans a reality’.